Manarah (pronounced me-NAR-uh), or ‘beacon’ in Arabic, is scored for two digitally processed antiphonal trumpets and orchestra, lasting approximately 8 minutes. The work features the orchestra’s two trumpet players in the left and and right balconies, calling back and forth to one another and the rest of the ensemble. They serve as pillars nestled high above the ground, inviting the orchestra to join them, like lighthouses beckoning ships safely to their shores. Both trumpet players are processed live through a software patch I created through MAX, which is triggered live onstage through a laptop. With this program, I explore microtonal intervallic relationships, glissandi, and unconventional changes in vibrato that are heard extensively in the traditional performance practice of Arabic musicians, most notably the Egyptian singer, Oum Kalthoum. With this work, I hope to showcase the rich musical culture of my Middle-Eastern heritage through the lens of my upbringing here in the United States. "A fanfare opens, seemingly tonal, but soon the harmonies are altered by microtones and glissandos, creating a much more complex landscape, all being subtly altered electronically in real time by the composer, who sat onstage at a laptop computer...Haddad’s intriguing textures made the night’s most arresting listening." 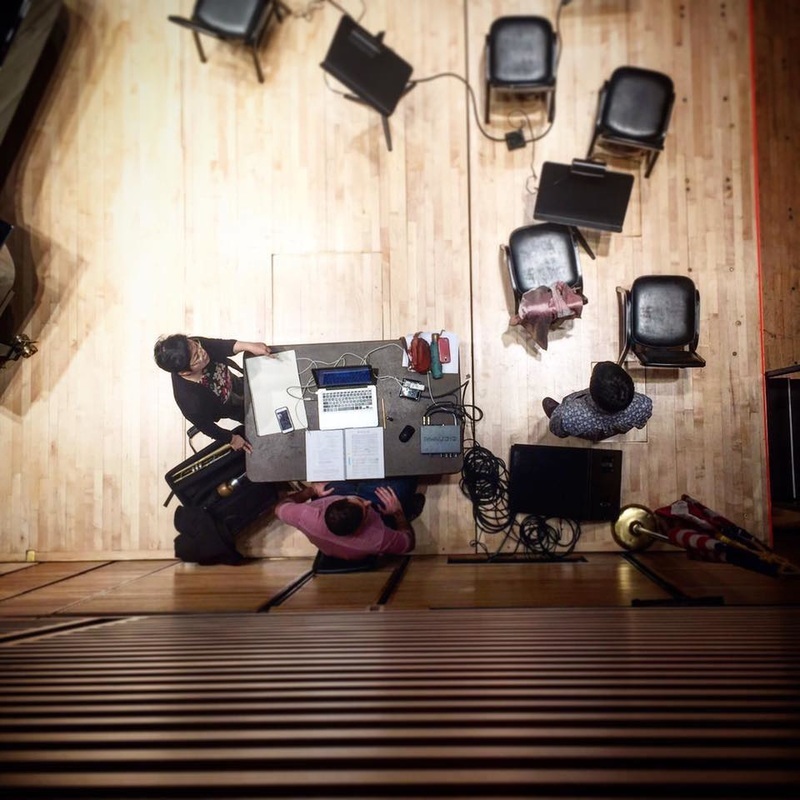 Saad Haddad (seated house left) digitally controls the sounds of the trumpets (balconies left and right) in real time with the American Composers Orchestra. Manarah is scored for 2 antiphonal trumpets, orchestra, and electronics. The trumpets should be positioned in the left and right balconies (at least one tier higher than where the orchestra is onstage), creating a stereophonic effect between the trumpets. Trumpet 1 should be placed in the Stage Right area, while Trumpet 2 should be placed on the Stage Left area. The 2 trumpets are each close-mic’d. Their live sound is processed in real-time during the performance through a Macintosh Laptop running my specially-designed patch in the software, “MAX,” which alters their live sound to produce the microtonally-inflected music (seen in the score) through the loudspeakers in the hall. There are no pre-recorded sounds used in this piece. The trumpet players are strongly advised to keep their bells positioned about 4 inches away from the microphone, and to abstain from moving the bell from that position. If clip-on microphones are used (which is strongly advised), then this consideration does not have to be adhered to. 1) read music; 2) see the conductor clearly, 3) use a Macintosh Laptop proficiently, with proficient knowledge of the software, MAX. In addition to the operator, there must be a sound technician present during the rehearsal and performance. S/he is in charge of the mixing console who adjusts the entire mix of the electronic sound live to tailor the acoustics of the hall (adjustments can be related to the volume and/or EQ of the mix; i.e., it is possible that the trumpet’s overall sound may be “too bright” for the hall, hence the technician can bring down the higher frequencies on his or her console). Mari Kimura, Saad Haddad, and Nathan Prillaman preparing the electronics for the premiere of Manarah at Carnegie Hall. -Audio Interface with at least 2 preamps and 2 outputs that can connect to a Macintosh Laptop. -“Manarah Final MAX Files” folder saved onto the Macintosh Laptop’s desktop (supplied by the composer). When the operator opens the patch, further directions on how to use the patch in rehearsal and performance is explained. -Mixing Console used by sound technician to maintain a balanced level and control EQ.